In the Malware Protection Test, malicious files are executed on the system. While in the Real-World Protection Test the vector is the web, in the Malware Protection Test the vectors are network drives and USB. Please note that we do not recommend purchasing a product purely on the basis of one individual test or even one type of test. Rather, we would suggest that readers consult also our other recent test reports, and consider factors such as price, ease of use, compatibility and support. Installing a free trial version allows a program to be tested in everyday use before purchase. In principle, home-user Internet security suites are included in this test. However, some vendors asked us to include their (free) antivirus security product instead. Information about additional third-party engines/signatures used inside the products: Tencent (English version), Total Defense and VIPRE use the Bitdefender engine. F-Secure uses the AVIRA engine. AVG is a rebranded version of Avast. All products were installed on a fully up-to-date 64-Bit Microsoft Windows 10 Pro RS5 system. Products were tested at the beginning of March with default settings and using their latest updates. The Malware Protection Test assesses a security program’s ability to protect a system against infection by malicious files before, during or after execution. The methodology used for each product tested is as follows. Prior to execution, all the test samples are subjected to on-access and on-demand scans by the security program, with each of these being done both offline and online. Any samples that have not been detected by any of these scans are then executed on the test system, with Internet/cloud access available, to allow e.g. behavioral detection features to come into play. If a product does not prevent or reverse all the changes made by a particular malware sample within a given time period, that test case is considered to be a miss. If the user is asked to decide whether a malware sample should be allowed to run, and in the case of the worst user decision system changes are observed, the test case is rated as “user-dependent”. This Malware Protection Test checks not only the detection rates, but also the protection capabilities, i.e. the ability to prevent a malicious program from actually making any changes to the system. 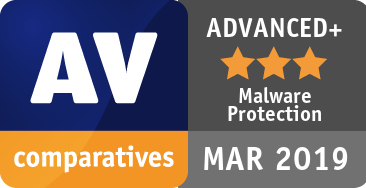 In some cases, an antivirus program may not recognise a malware sample when it is inactive, but will recognise it when it is running. Additionally, a number of AV products use behavioural detection to look for, and block, attempts by a program to carry out system changes typical of malware. Our Malware Protection Test measures the overall ability of security products to protect the system against malicious programs, whether before, during or after execution. It complements our Real-World Protection Test, which sources its malware samples from live URLs, allowing features such as URL blockers to come into play. Both tests include execution of any malware not detected by other features, thus allowing “last line of defence” features to come into play. The test set used for this test consisted of 10,970 malware samples, assembled after consulting telemetry data with the aim of including recent, prevalent samples that are endangering users in the field. Malware variants were clustered, in order to build a more representative test-set (i.e. to avoid over-representation of the very same malware in the set). The sample collection process was stopped on the 28th February 2019. The test-set used contained 10970 recent/prevalent samples from last few weeks. 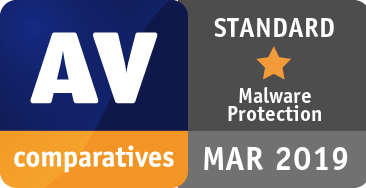 In order to better evaluate the quality of the file detection capabilities (ability to distinguish good files from malicious files) of anti-virus products, we provide a false alarm test. False alarms can sometimes cause as much trouble as a real infection. Please consider the false alarm rate when looking at the detection rates, as a product which is prone to false alarms may achieve higher detection rates more easily. In this test, a set of clean files is scanned, and a representative subpart of the clean-set is executed (as done with malware). Details about the discovered false alarms (including their assumed prevalence) can be seen in the False Alarm Test March 2019. A product that is successful at detecting a high percentage of malicious files but suffers from false alarms may not be necessarily better than a product which detects fewer malicious files, but which generates fewer false alarms. 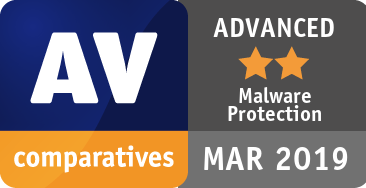 AV-Comparatives provides ranking awards, which are based on levels of false positives as well as protection rates. As this report also contains the raw detection rates and not only the awards, expert users who may be less concerned about false alarms can of course rely on the protection rate alone. Details of how the awards are given can be found on page 8 of this report.